But here’s our first contribution. Romina Berardi is an interpreter & translator by occupation but also loves photography. 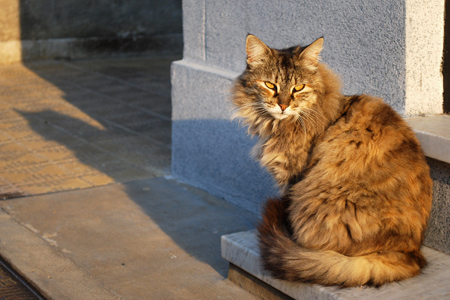 Her equipment of choice is a Nikon D60, & I couldn’t resist her capture of a cat at sunset. Thanks for the contribution! The last time I visited Recoleta I spent most of the time chasing cats! I regreted so much not having my camera with me and so I lost a lot of opportunities to take pictures like this. If you now accept contributions, you will receive mine for sure. I just can’t resist looking at those beautiful creatures. Hi Ricky – If you have a good cat pic, I’d be happy to post it here… I just worry that we’ll fill up the webpage with cat photos! :-) When you go back, say hi to my buddy for me!